Naidex National, the UK’s largest independent living and mobility show, announces its 2015 programme today. Over 10,000 visitors are expected to meet more than 250 exhibitors and attend the free CPD accredited conference at the event. Naidex is the only national exhibition for independent living that brings together consumers, health and social care professionals plus specialist manufacturers, retailers and public sector purchasers. It offers the latest thinking, strategies and solutions to support the ageing population and those affected by, or living with, disabilities. Free to attend tickets are available at www.naidex.co.uk. Naidex National’s conference programme provides a perfect forum for all sectors to meet, work and share solutions for independent living. The dedicated programmes run over a number of theatres, including two theatres in the COT Zone delivered by the College of Occupational Therapists. There is also the CPD-accredited Multidisciplinary Theatre (offering practical healthcare support with Certificates of Attendance provided to fulfill CPD requirements). The Commerce and Industry Theatre, providing retail and trade visitors the latest business, legislative and service improvement advice also returns. The College-led COT Zone programme includes student-focused seminars, workshops and professional surgeries with College staff. Confirmed speakers include Sue Adams OBE, chief executive of Care and Repair England who will focus on home adaptations, the Care Act and the Better Care Fund. Jilly Polson, dementia lead associate in Dementia Services Development Centre at the University of Stirling will look at designing for dementia. Sara Thomas, diligent public health UK manager at ArjoHuntleigh will present a session on manual handling, whilst Hayley Goodwin, specialist OT from Hertfordshire Partnership Foundation Trust will review the use of iPads for therapy assessment. The Multidisciplinary Theatre, which is open to all visitors including carers, end users and their families, will focus on moving and handling, telecare and dementia care. A key session includes ‘Integrated community equipment services, recommending telecare services’ delivered by Holly Gittings, specialist telecare service manager from the Gloucestershire County Council Specialist Telecare Team. Another priority session is ‘Fall prevention – managing patient falls’ from Stephanie Kane, falls prevention practioner at Royal Shrewsbury hospital NHS trust and Dr Wallace Tan, consultant geriatrician at Croydon Health Services NHS. Business and trade visitors will be offered a VIP pass giving them access to the Business Club and the dedicated Commerce and Industry Theatre, which will deliver three days of talks. The new Meet the Trade initiative will include facilitated networking and one-to-one appointments. The Business Club also includes access to private meeting rooms for confidential supplier meetings and the opportunity for trade-only show deals. 2015 will see a host of new features début at Naidex – a visit to the Charities Zone will offer the opportunity to get advice from condition specific charities. Also new is the Design Award, a publicly voted award for product design. The popular Car Zone has already sold out and the test drive area returns with the added option to test motorised wheelchairs and scooters. Visitors will have the opportunity to view the latest adaptable vehicles and mobile homes from the likes of Lewis Reed, Gowrings, Sirus Automotive and Brotherwood Automobility. There will also be multiple Meet the Expert opportunities from organisations such as the College of Occupational Therapists’ Specialist Section – Independent Practice. The Innovation Trail returns and will feature over 40 brand new products, while the Market Place will be a one-stop shop to pick up smaller, take-home products. Naidex National allows visitors to touch, test and compare the latest mobility and transport, communication and telecare, access and adaption, paediatric equipment and other daily living aids. New exhibitors for 2015 include health and education assessment tool developers Pearson, fledgling leisure company i-glider and Valor Enterprise, a specialist personal care company from Taiwan. Returning brands include AKW, Joerns, Patterson Medical, ETAC, Pride Mobility, Geberit Sales, ArjoHuntleigh, Midshires Specialist Rehab, RBF Healthcare and Ottobock. A number of well-respected organisations will be on hand to offer advice, such as the Health Design & Technology Institute, the Blackwood Foundation, the RNIB Pears Centre for Specialist Learning, the National Back Exchange, the Health and Care Professions Council, Motability, the Spinal Injuries Association and Skills for Care. Naidex partners include the British Healthcare Trades Association (BHTA), the College of Occupational Therapists (COT) and the National Wheelchair Managers Association (NWMF). To discuss exhibition space and sponsorship opportunities at Naidex National, please contact the team on 0203 033 2273 or naidex@i2ieventsgroup.com. 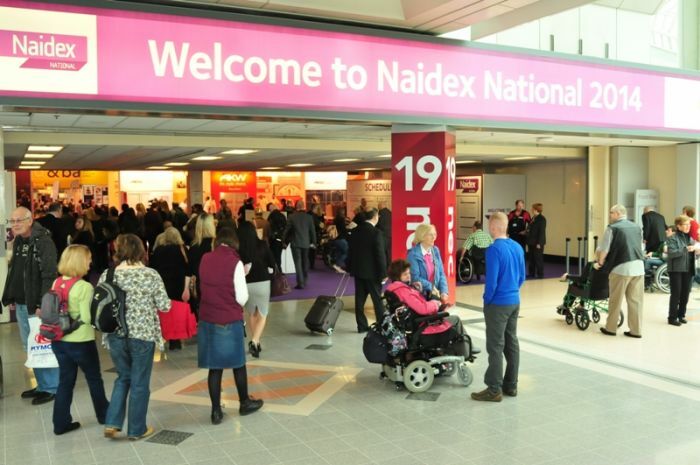 Naidex National 2015 will take place at the NEC, Birmingham, from 28 to 30 April next year. Visit www.naidex.co.uk to register for your ticket and for more information. * The COT Zone’s content is tailored to the needs of Occupational Therapists, therefore only Occupational Therapists will be permitted entry to these sessions. Naidex is the UK’s leading event for the Independent Living and Disability sector which has been running for 41 years. Over 10,000 healthcare professionals, manufacturers, retailers, government and local authority representatives, carers, end-users and their families attend Naidex each year to keep up to date with developments in the industry, seek advice, upskill, share best practice and source innovative new products to improve lives. Be the first to comment on "Naidex National announces conference programme for 2015 "